1) The house must have an airtight building shell. Quantitatively expressed, the leak rate for a differential pressure of 50 Pascal pressure must be less than 0.6 air changes per hour, measured by a blower-door test. In a passive house, the air is exchanged with outside air frequently, but in a controlled fashion using an energy recovery ventilator such that at least 80% of the heat in the outgoing exhaust air is transferred to the incoming fresh air. This standard ensures that cold air doesn't leak into the house directly. My house has a volume of 16000 cubic feet, so the standard calls for a leak rate of less than 160 cfm at 50 Pa. My current leak rate is 195 cfm or 0.73 air changes per hour. 2) The annual heat requirement must be less than 1.39 kWh/ft2/year. This standard insures that the building not use "too much" heating which requires a bit more explanation. A building loses heat due to thermal conduction through the building envelope (walls, roof, windows, slab). The heat loss depends on the insulation and the climate through the number of degree heating days and the amount of sunlight. The building gains heat by sunlight passing through the windows and through internal gains, meaning the heat the inhabitants give off as well (~80 Watts per person) as the waste heat generated by lighting, appliances, computers, etc. 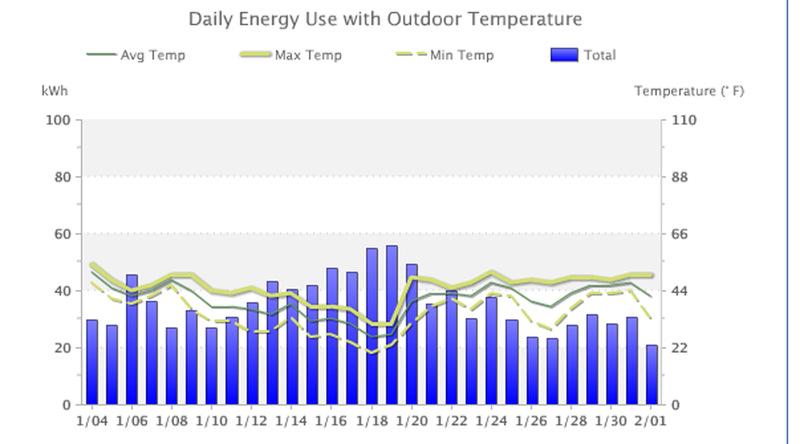 For my 1468 sq ft house, the heating demand should be less than 2041 kWh/yr. At the local electricity rate, that translates into $204/yr. 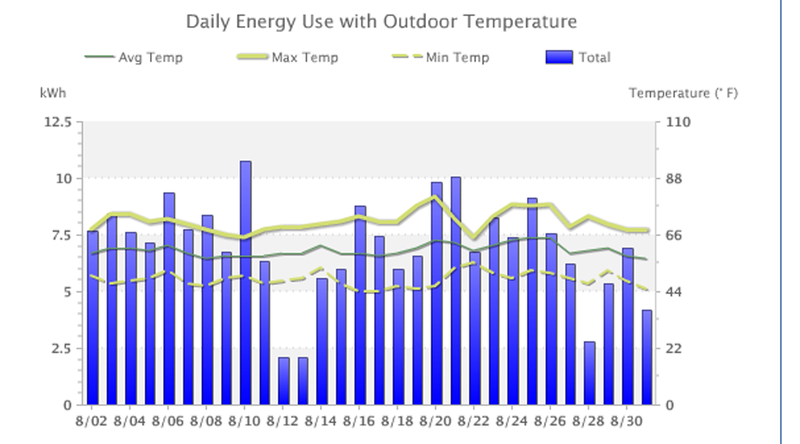 3) The primary energy used by all aspects of the house must be less than 11.1 kWh/ft2/yr or 16,350 kWh/yr for my house. OK, what is primary energy? Using electricity as an example, primary energy is not the energy you measure at the electrical meter, but rather the energy used to generate the electricity you measure at the meter. Primary energy accounts for the energy consumed on site in addition to the energy consumed during generation and transmission in supplying the energy to your site. Whereas requirement 2) includes only heating, requirement 3) includes both heating and cooling as well as lighting, appliances, etc. The Passive House Institute uses a site independent factor of 2.7 to convert secondary electrical energy measured at your meter to primary energy. The corresponding factor for natural gas, which could be used to heat water or provide space heating instead of electricity is 1.1. DO THE 3 PASSIVE HOUSE CRITERIA MAKE SENSE IN EVALUATING HOUSES OVER A WIDE GEOGRAPHICAL AREA IN THE US? The simple answer is NO. Let's look at the three criteria individually keeping in mind that the goal is to conserve energy. Each criterion should measure up to this goal. 1) The average annual temperature in Honolulu is 72F and the average annual temperature in Minneapolis is 45F. A given leak rate through the building envelope is going to cost much more energy in Mineapolis than in Honolulu, where it is zero. 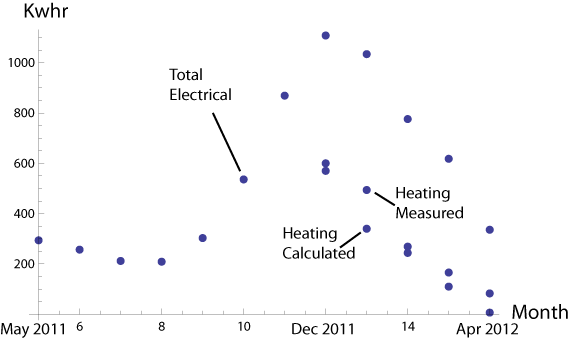 A more sensible criterion on leaks would link the leak rate to the sum of the degree heating and cooling days so that you are measuring the energy cost of the leak rather than putting out an arbitrary number. My house has a higher than allowed infiltration rate. 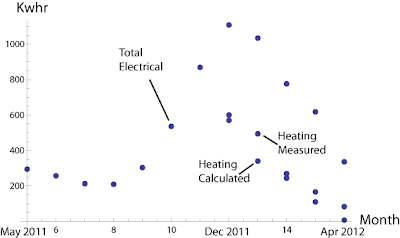 What is the energy loss due to the higher leak rate? It's 82 kWh per year or a cost of $8.20 compared with an annual total energy cost of about $600. Is this a significant waste of energy? The value of 0.6 air changes per hour is an arbitrary number that is not closely related to saving energy. 2) The heating demand is determined by two site dependent quantities: the number of degree heating days and the sunlight coming through the windows. 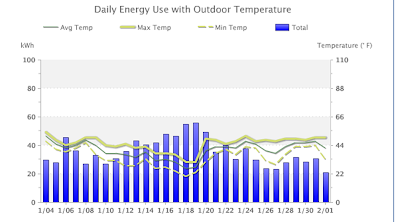 Honolulu has zero degree heating days. You could meet the second Passive House criterion in Honolulu using paper walls. A more sensible criteria would be to combine the heating and cooling demands. 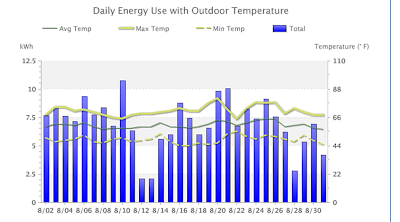 By that measure, San Diego has the ideal climate with 1072 annual heating plus cooling degree days. Plus the sun shines a lot. Anyone should be able to design and build a net zero energy house in San Diego - a far higher standard than the passive house. 3) Using primary energy as a criterion is a sensible approach which includes full cost accounting of energy production. However, the Passive House Institute Institute assumes a SITE INDEPENDENT FACTOR to calculate primary energy. This makes no sense because these factors are different in all 50 states. Source factors for electricity generation have been tabulated by M. Deru and P. Torcellini in NREL Technical Report NREL/TP-550-38617 entitled "Source Energy and Emission Factors for Energy Use in Buildings". The source factors vary between 7.94 for the District of Columbia to 1.67 for Oregon. Washington, where I live, has an electricity source factor of 1.74. Oregon and Washington values are low because most of the electricity comes from river water - little burning of coal or natural gas. Finally, there is no provision in the standards for the production of photovoltaic energy. If you harvest sunlight thermally to provide hot water, the Passive House Institute gives you a gold star. However, if you generate electricity on your rooftop and feed it into the grid to offset the electricity you use to produce hot water, no gold star. Does this make sense to you? So the purpose of this posting is to point out that the certification standards could be improved considerably. I'm a bit cantankerous and don't jump through hoops that don't make sense to me. So am I going to have my house certified? Tune in for a later blog and I'll tell you. It's not the yes or no that is important - it's how I got there.